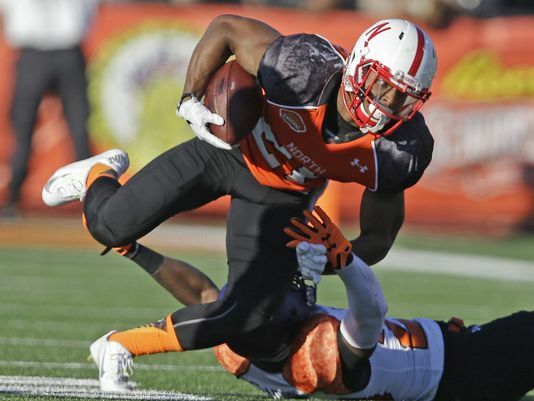 Nebraska running back Ameer Abdullah led his team in rushing and receiving and was voted the MVP of the 2015 Senior Bowl. The Senior Bowl signals the real start of the NFL Draft season. The week in Mobile, Alabama is the first premiere event in the evaluation of players for the draft. What I really like about Senior Bowl week is that you get to see players compete against each other one on one. At times it’s hard to give a fair grade to an offensive lineman because they are all working together as a unit. However, if you get him one on one against a defensive lineman, you can see his strengths and weaknesses. I have a lot of player notes, so I will do the North team today and the South team tomorrow. Bryce Petty, QB, Baylor (6-3, 230): Had some issues taking direct snaps from the center since he worked from the shotgun all the time for the Bears. Used to making one read and either throwing the ball or running. Struggles at times reading progressions and finding second and third receivers. Won 21 of 25 games at Baylor. Needs to clean up his technique and footwork. Tends to be a streaky player (both good and bad). Does a good job extending plays. Completed 9 for 13 for 123 yards and 1 INT. Sean Mannion, QB, Oregon State (6-5, 229): Tall, lanky build. Looked very comfortable in the pro-style offense since he played in a similar system for the Beavers. Needs to quicken his reads and release of the ball. Has a tendency to be very deliberate which can translate to sacks or picks at the next level. Good arm strength. Good pocket awareness and he does a good job sliding and buying time. Very good understanding of the game. Good ball location. Completed 9 of 14 for 79 yards and 1 TD. Also ran twice for 6 yards and had a fumble. Shane Carden, QB, East Carolina (6-2, 218): Doesn’t have great size and lacks great athleticism, but he is scrappy and competitive. Good ability to rally his team when they are behind. Moves well in the pocket. Tough and poised and will continue to deliver the ball even when getting hit repeatedly. All-time leading passer for the Pirates. Does a good job when he escapes to the edge. Doesn’t have classic delivery, but is an effective passer. Completed 4 of 7 for 70 yards. Ameer Abdullah, RB, Nebraska (5-8, 198): The first Nebraska player to have three straight seasons rushing for over 1,000 yards. Not real big, but runs with power between the tackles. Has great quickness and runs with determination. Good burst through the hole. Makes great cuts. Has small hands and has a tendency to fumble the ball. Slips tackles in space. Catches the ball well out of the backfield and is tough for linebackers to cover. Gives good effort in pass protection. Led the North team with 73 rushing yards on 7 carries and had a long gain of 25 yards. Also led the North team with 4 catches for 40 yards. Voted the game MVP. Jeremy Langford, RB, Michigan State (6-0, 211): Good burst through the hole. Runs great routes and is tough for linebackers to cover. Looked good early in the week, but then suffered an injury and was unable to finish the week. David Cobb, RB, Minnesota (5-11, 229): Very good north – south runner with good speed for his size. Runs with power. Great feet with a very good jump cut. Gives a second effort after contact. Good vision to find the right hole. Spins off tackles. Has a nose for the end zone. Good receiver. Had 11 carries for 69 yards and 1 TD and a long run of 25 yards. Had 2 catches for 16 yards. Tyler Varga, FB/RB, Yale (5-10, 227): Had a surprisingly good week. Showed versatility to do anything you would want from a running back or fullback. Has a rocked up body. Runs with determination. Good lead blocker. Catches the ball well. Complete back. Had 4 carries for 31 yards and 3 catches for 39 yards. Vince Mayle, WR, Washington State (6-2, 219): Great size. Tied for #4 in the country with 106 receptions in 2014, which was also a school record. Has a good second gear that allows him to separate from a defender. Snatches the ball from the air. Takes on tacklers. Shields off defenders with his body. Able to return kickoffs. Tony Lippett, WR, Michigan State (6-2, 192): Versatile player that also played some corner for the Spartans late in the year. Good size. Smooth. Former high school QB. Had 1 catch for 7 yards and attempted one pass, but it was incomplete. Devin Smith, WR, Ohio State (6-0, 190): Averaged over 28 yards per reception for the Buckeyes. Great deep threat. Does a great job tracking the ball on deep throws which allows the QB to just throw it up and let him go get it. Makes people miss in space. Good vertical jump. Has the ability to make circus grabs. Had a big hit on special teams. Seemed to be concentrating this week proving that he can run short and intermediate patterns. Ty Montgomery, WR, Stanford (6-0, 216): Great body with low body fat. Good strength and has the speed to get deep. Able to juke defenders in the open field. Good kick returner. Needs to work on his concentration due to a tendency to drop passes. Antwan Goodley, WR, Baylor (5-10, 210): Former running back. Very good yardage after the catch. Quick off the snap of the ball. Snatches the ball and doesn’t let it get in to his body. Does a great job on sideline throws and shows an ability to drag his feet to get the completion. Had 2 catches for 37 yards. Jamison Crowder, WR, Duke (5-8, 174): Small but extremely quick. Excellent returner. Able to make breaks at full speed. Catches the ball with his hands away from his body. Even though he is short, he can elevate to make tough catches. Tough to match up against. Tracks the ball well when it’s in the air. Had 1 catch for 6 yards and returned punts. Justin Hardy, WR, East Carolina (5-10, 190): Was #2 in the country behind Amari Cooper with 121 catches. Good ability to get deep and run by defenders. Nice footwork. Excels on the tunnel screen. Turns upfield quickly after the catch. Fights off press coverage. Had 1 catch for 8 yards. Nick Boyle, TE, Delaware (6-4, 267): Punishing blocker that can line up on the line of scrimmage or as a lead fullback. Runs good routes. Catches the ball at the highest point. Surprising athleticism and ability to hurdle tacklers. Had a very good week and opened some eyes. Had 2 catches for 31 yards with a long catch of 22 yards. Ben Koyack, TE, Notre Dame (6-5, 249): Good combination blocker/receiver. Big target. Tough to bring down after the catch. Good hands. Had 2 catches for 19 yards and 1 TD. Laken Tomlinson, G, Duke (6-3, 323): Great base and anchor in pass protection set. Stays square to the defender. Great strength. Battler that looked very good against Danny Shelton who also had a very good week. Voted Best Offensive Lineman for the practice week. Max Garcia, G, Florida (6-4, 305): Maryland transfer. Stout at the point of attack. Also held his own against Shelton. Ali Marpet, OL, Hobart (6-4, 307): Did very well for a Division III player against elite competition. Played left tackle, but would probably be better inside at guard or center. Moves very well. Battled some very good defensive linemen and held his own. T.J. Clemmings, OT, Pitt (6-5, 307): Raw offensive tackle that played on the right side for the Panthers. Only played two years of high school ball and started his career at Pitt as a defensive lineman. Only two years of experience on the offensive side of the ball. Has the physical ability to play on the left side, but he is extremely raw. Has good feet and long arms which NFL scouts want to see for a left tackle. However, he can be beaten with an inside pass rush and at times he reaches and over extends rather than moving his feet. Would be a project for a left tackle, but he might be able to play on the right side and eventually move to the left. Rob Havenstein, OT, Wisconsin (6-7, 332): Massive offensive lineman that is likely locked in as a right tackle. Does a good job protecting the inside gap. Smart player that understands and plays within his limitations. Does a good job rerouting pass rushers. Had a surprisingly good week. Za’Darius Smith, DE, Kentucky (6-5, 270): MVP of the East – West Shrine Game last week. High motor. Versatile player that can play the run or rush the passer. Does a good job pressuring quarterbacks. Has a good inside pass rush move and also has a good spin move. Henry Anderson, DE, Stanford (6-6, 287): Has experience as a 3-4 defensive end and is a prototypical 5 technique. Long body type with long arms. Uses hands very well. Knows how to get off of blocks. Had a solid week and probably improved his draft stock. Danny Shelton, DT, Washington (6-2, 343): Low center of gravity and built like a fireplug. Led the Huskies in tackles which rarely happens for a defensive tackle. Moves very well for his size. Doesn’t take plays off. Able to push the pocket and put pressure on the QB. Can take an offensive lineman and throw them aside like a rag doll. Great hump move. Immovable. Got award for Best Defensive Lineman for the practice week. Carl Davis, DT, Iowa (6-5, 321): Great size, but moves extremely well. Strong at the point of attack. Quick first step. Uses his hands well. Able to put pressure on the QB from the inside. Disruptive player that gets upfield to create havoc. Had a tackle for loss. Was voted the Most Outstanding Player of the practice week. Nate Orchard, DE/OLB, Utah (6-3, 251): #2 in the country with 18 ½ sacks and #5 in the country with 21 tackles for loss. Doesn’t have quick twitch muscles but plays with heart. Played defensive end for the Utes, but could be asked to convert to linebacker at the next level. Good speed rush. Knows how to get into passing lanes. Quick reactions. Gets off blocks. Strong hands. Smart player that stays at home on plays away from him. Had a tackle for loss in the game. Hau’oli Kikaha, DE/OLB, Washington (6-2, 246): Played defensive end until his senior season when he was moved to linebacker. Led the country with 19 sacks and was #2 in the country with 25 tackles for loss. Productive pass rusher. High motor. Uses his hands very well. Good spin move when rushing the passer. At his size, he will likely stay at linebacker in the NFL. Zack Hodges, OLB, Harvard (6-3, 242): Co Defensive Player of the Year in the Ivy League. Tough player that played all week with a knee issue. Jeff Luc, ILB, Cincinnati (6-0, 263): Rocked up and is a beast stopping inside runs. Is a bit stiff, but he chases the ball sideline to sideline and he understands angles really well. Better in coverage than you would think. Good special teamer. Had a good week. Hayes Pullard, ILB, USC (6-0, 236): Versatile player that has played safety, outside linebacker and inside linebacker for the Trojans. Good instincts. Is a bit undersized for the middle at the next level and may be a better fit outside. Runs well. Had a tackle for loss. Josh Shaw, CB, USC (6-1, 200): Suspended for most of the year for lying about how he hurt his ankle. Good build, long arms. Has some tightness in his hips. Good closing speed. Might be looked at as a safety. When he gets beat deep, he sometimes panics and doesn’t trust his technique. Was called for a pass interference penalty on a long pass. Quinten Rollins, CB, Miami – Ohio (5-11, 193): Great athlete that was also the point guard on the basketball team. Was #2 all-time for the Redhawks in steals. Very good ball skills. Good instincts. Keeps good inside position. At times he gets beat deep. I’m interested in see his 40 time at the NFL Combine. If his speed isn’t in the 4.5 range, he may be a better fit at safety. Had an interception in the game. Steven Nelson, CB, Oregon State (5-11, 199): Small and tough and is called Mighty Mouse. Aggressive and does a good job battling larger receivers. Breaks well on the ball. Great footwork. Stays in good position. Gets his hands on a lot of balls. Quandre Diggs, CB, Texas (5-9, 196): NFL bloodlines. Brother of former Chargers corner Quentin Jammer. Not very big, but doesn’t back down. Will bring the wood when making hits. Excels when covering the slot. Great instincts. Can bait the QB, then jump the route. Had an interception in practice and in the game. Ibraheim Campbell, S, Northwestern (5-11, 210): Does a good job in man or zone coverage. Breaks well on the ball. Smart player that takes good angles. Plays with intensity. Good tackler. Tomorrow I will post my analysis of the players from the South squad. If you like what you read, like us on Facebook and tell your friends. This entry was posted on January 28, 2015 by draftmaniacs in All-Star Games and Combine and tagged 2015 NFL draft, Ali Marpet, Ameer Abdullah, Antwan Goodley, Ben Koyack, Bryce Petty, Carl Davis, Danny Shelton, David Cobb, Devin Smith, Hau’oli Kikaha, Hayes Pullard, Henry Anderson, Ibraheim Campbell, Jamison Crowder, Jeff Luc, Jeremy Langford, Josh Shaw, Justin Hardy, Laken Tomlinson, Max Garcia, Nate Orchard, NFL, NFL Draft, Nick Boyle, Quandre Diggs, Quinten Rollins, Rob Havenstein, Sean Mannion, Senior Bowl, Shane Carden, Steven Nelson, T.J. Clemmings, Tony Lippett, Ty Montgomery, Tyler Varga, Vince Mayle, Za'Darius Smith, Zack Hodges.